Sintra is only an hour out of Lisbon, which makes it the perfect day trip. It's one of the most visited places in Portugal, and for good reason! 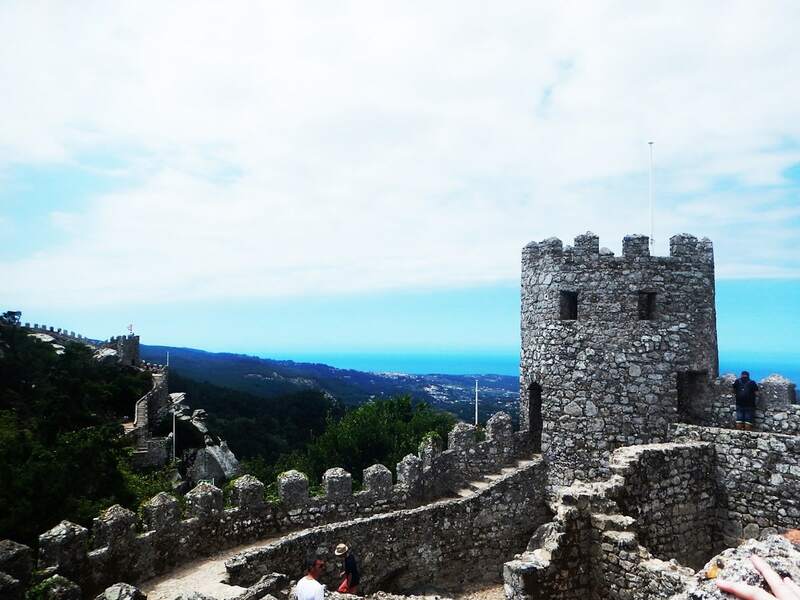 However, as there is so much to see in Sintra, if you want to visit all the spots, you'll need more than a day! This post will share five places that should definitely be on your list, as well as some useful tips for your visit! 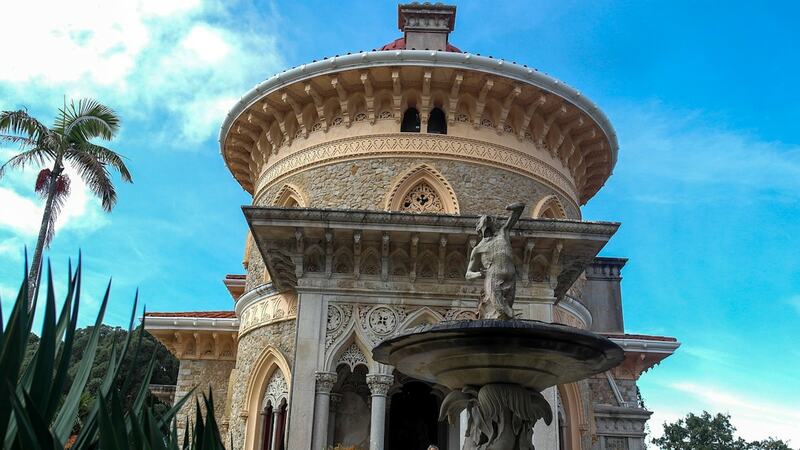 Sintra is the perfect day trip from Lisbon. It's super easy and it's really affordable. The round-trip with a direct train will cost you around €5. Be sure to get the first train out though as it's really popular and gets really busy as the day goes on. Make sure you get to the station with plenty of time... when we went the ticket counters were pretty busy and we had to queue quite a while, we literally managed to catch the train with seconds to spare. Otherwise, if you have a car you might prefer to drive, which may be more convenient and flexible. We actually have a car, but heard that it can be quite hard to park so decided not to bother. I've since heard otherwise that it's not too bad so maybe that would be the better option. 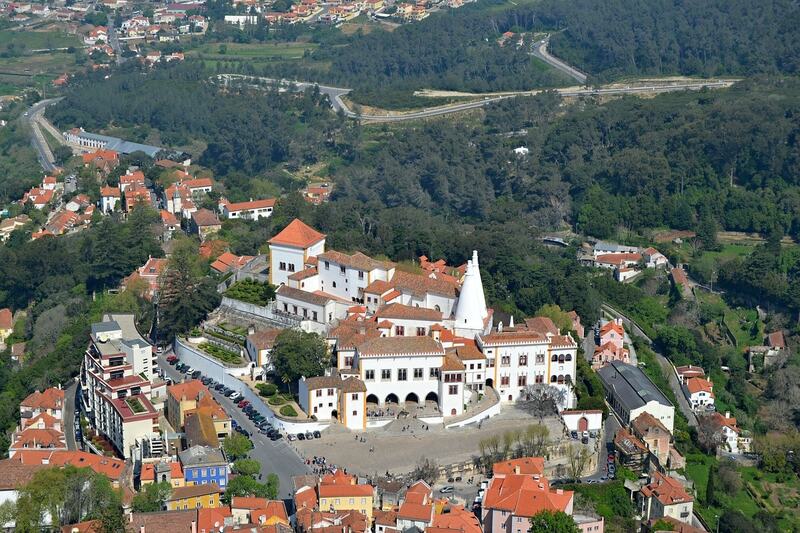 It's very easy to get around Sintra, there are loads of buses that stop at all the major tourist sites. When you get of the train, you're either going to want to head straight to the buses, or flag down a 'taxi', which are similar to tuk tuks. The bus queue was huge by the time we got to it, so we decided to go for a taxi, it took a few minutes and we were getting a bit anxious that we should have just gone with the bus, but don't fret, a taxi turned up soon enough and the driver was fantastic and gave us lots of tips and pointed out various points of interest. So if I was you, I'd aim for a taxi - that way you can get straight to your first stop - I suggest Pena Palace first to avoid the crowds! You can pay for the buses with the driver when you get on, and you can either get the 434 circular route or the 435 hop on hop off. I'd opt for the 434 as it's cheaper and covers the main stops you'll want to make. If you're prepared to do some walking, you definitely could walk, but I'd do what we did... get a taxi to the top of the hill to Pena Palace and then make your way down. Be prepared for lots of hills though. We did see two people walking from the bottom, and let's just say, it didn't look fun! If you're only doing a day trip, the number one thing I would say, is DON'T try to see everything. Pick a few places and do them properly rather than rushing between everything. 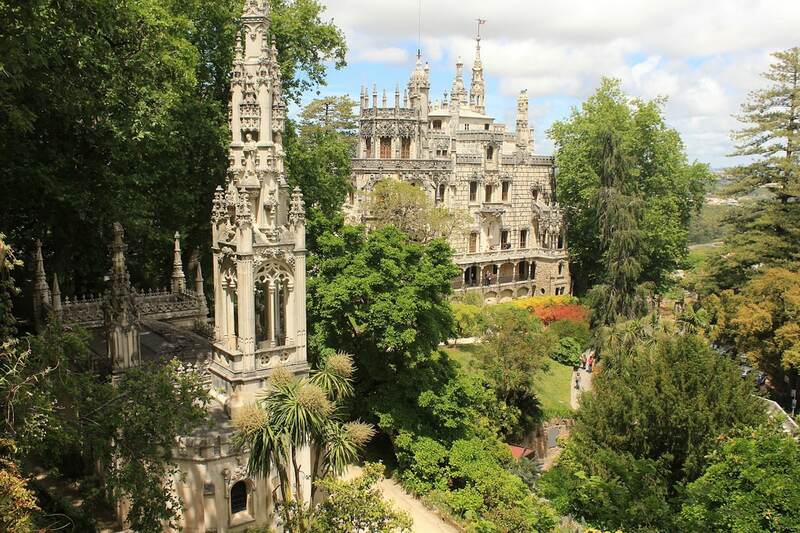 There are so many things to do in Sintra, you could easily spend two or three days exploring. We managed to fit in Pena Palace, the Moorish Castle and Quinta da Regaleria in one rather long day. But I'm definitely keen to go back one day and see everything else! Based on the bus routes, we figured less people would visit Pena Palace first, so decide to make it our first stop. We didn't have to wait too long, and we bought our tickets online before we got there. The entrance fee is a little pricey, €14 for an adult, although I think it was a bit cheaper online. The palace was built in the 19th century by the Royals. It reminds me of something out of Disney covered in vibrant colours with mythological creatures adorning the walls. 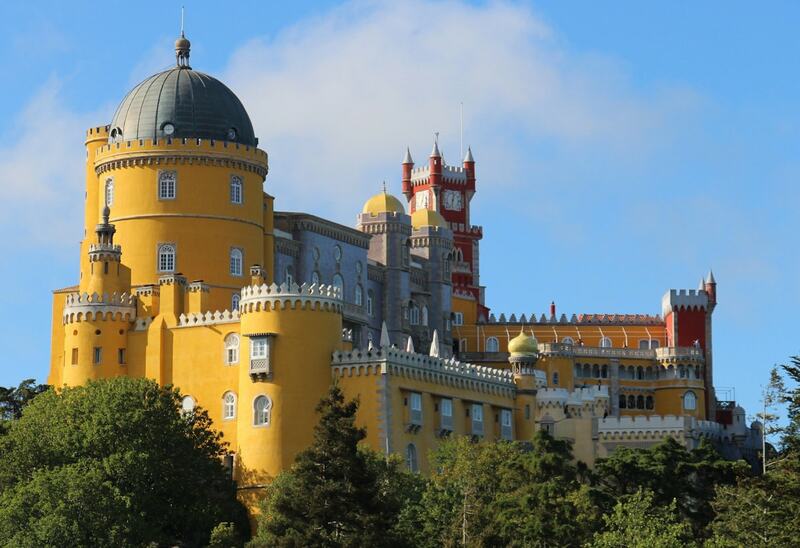 The palace is built on top of the hill, so boasts a fantastic view of Sintra. Surrounding the palace is a gorgeous park, so be sure to leave enough time to explore it! After walking through the Pena Palace park, we walked over to the Moorish Castle, which wasn't actually too far to walk. This may have been my favourite place. It was built in the 8th and 9th century, how on earth they managed to built it back then I have no idea. Much of it was unfortunately destroyed by an Earthquake in the 18th century, but luckily it has been somewhat restored. 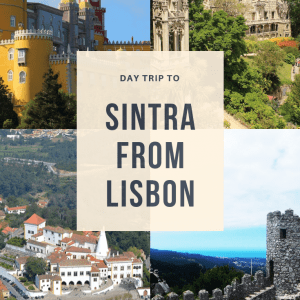 You won't actually see a 'castle' as such, and it certainly isn't as elaborate as the other palaces of Sintra, however, it is still incredibly impressive. It is full with fascinating history, and boasts incredible unobstructed views all around. After visiting the Moorish Castle, we walked down the hill into the town centre, stopped for a pastry and a drink and then walked over to the Quinta da Regaleria, a UNESCO World Heritage site. In the summer it's open until around 8pm so it's a great place to visit last. Whilst the building is pretty interesting, it's the grounds that make this place worth visiting. It's filled with beautiful ordinate benches, gates and fountains scattered throughout the picturesque gardens. But it's the fascinating tunnels that pop up throughout the grounds that I loved the most. Particularly, the Initiation Well, which you can follow down the spiral stairway into the tunnels below. We didn't venture inside as we knew we had to be strict on what we could see, but it is very beautiful from the outside, and if we were spending more than a day we would have definitely have gone inside. It's near the centre of the town, so will be the first Palace that you see when you arrive. Inside you'll get a glimpse into how the Portuguese Royals used to live. We also didn't get a chance to visit the Monserrate Palace. But I've heard it is absolutely gorgeous and well worth the visit. The gardens are said to be incredible, and the palace is equally impressive. And as a bonus, it's less busy than the other sites of Sintra! After reading this post from the guys over at Hand Luggage Only, I am 100% certain that I will be back to visit this beauty. Make sure to pack suncream, bring a hat, and plenty of water. Even if you're not planning to walk between each site, you'll still be doing plenty of walking through the grounds, along the walls and inside the palaces. So make sure you have something comfy and sturdy on your feet! The attractions do have small food areas but they aren't great and they are quite pricey, so think about bringing some bits with you, or stop in the town centre for a snack along the way. Just be careful of the tourist traps!